One of my favorite year-end skateboarding articles is Ripped Laces’ top skate shoes of the year (S.S.O.T.Y.). While it goes without saying that ranking the multitude of skate shoes thrown at us each year is highly subjective, you’re unlikely to find a more well thought-out or amusing ranking than the one provided by the folks at Ripped Laces. While 2017 brought us a new kind of high top, the return of heel airbags, and another high water mark for the rubber toe cap, the top spot was nabbed by Gilbert Crockett’s second Vans pro model. It’s no secret that Gilbert is a humble killing machine and one would expect his shoe to function as flawlessly as he does. If you were to list the most iconic companies in skateboarding’s history, you’d be hard-pressed to find a company that has left a more indelible mark on skateboarding than Vans. While it’s easy to look back at Vans’ history and deduce a very common theme to the vast majority of their models, Vans has not been immune to shifts in public consciousness as to what constitutes style. 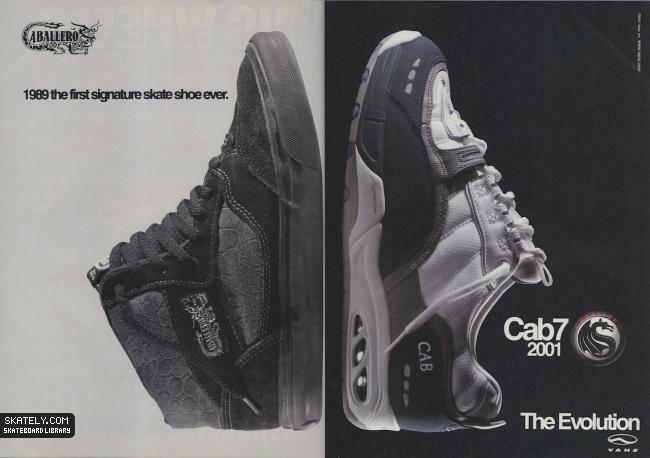 For example, Caballero’s sixth and seventh models were a far cry from the Half Cab (arguably the most successful skate shoe in history); the Rowley XLT and XL3 tried to hang on to the patented Vans style while cautiously branching out into a world obsessed with making shoes light enough to float; and of course, who could forget the Dr. T? One of the key factors to Vans’ early success, however, remains virtually unchanged to this day: the waffle sole. Suede or canvas, high top or low top, stripe or no stripe, almost every Vans model has been blessed with the sticky waffle pattern skateboarders know and love (though that’s not to say there aren’t minor variations, like the introduction of the Waffle Cup or the pattern on the sole of the Kyle Walker Pro). It stands to reason that with such a patented recipe for success, skateboarders will be able to count on the waffle sole under their feet for decades to come. But, alas, while I love discussing skate shoes past and present, this blog is dedicated to cooking. In honor of the famed waffle sole that has permeated skate fashion and function for over 50 years, I present a more literal waffle: Vans-Inspired Sweet Potato Waffle Soles. Much like waffle soles are a perennial favorite of almost every skateboarder, (edible) waffles are always a welcome breakfast treat. Unfortunately, they are not always a skate-friendly treat, as they typically have a good amount of butter, sugar, and other ingredients that cause inflammation in the body, rather than reducing it. Thankfully, waffles don’t always have to involve copious amounts of sugar, bleached flour, and chocolate chips; it’s just as easy to make waffles out of healthier ingredients. If you’ve been following this blog, you’ve almost certainly heard me gush about sweet potatoes and their inflammation-fighting magic. 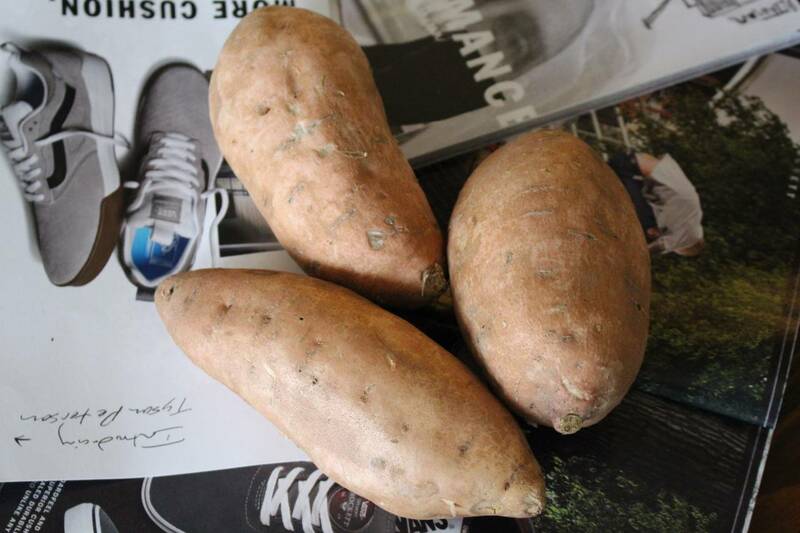 High in beta carotene, fiber, vitamin C and B vitamins, the sweet potato is always a welcome alternative to regular potatoes. 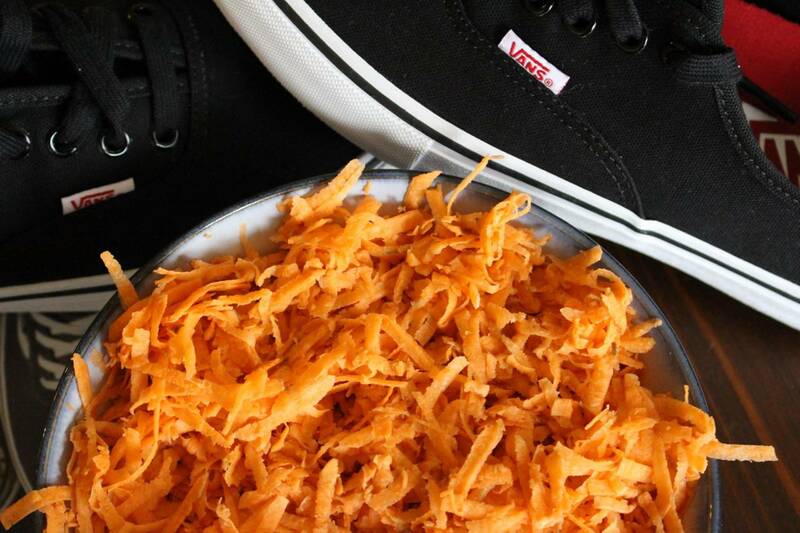 Much like the Vans Waffle Cup finds the best of both worlds in the marriage of both the cup sole and vulcanized sole, this waffle finds the perfect middle ground of crispy sweet potato hash browns on the outside and warm, tender sweet potatoes on the inside. 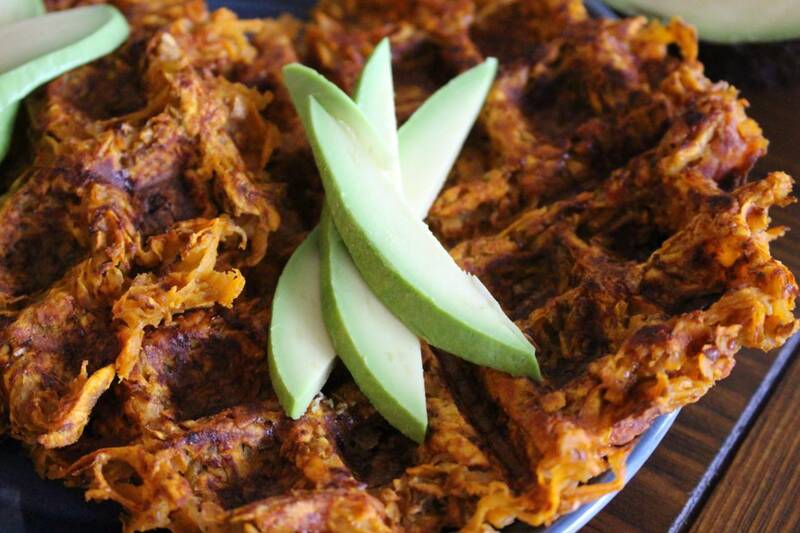 Spiced up with cumin, paprika and cinnamon (trust me) and topped with avocado, these soleful waffles are a great way to have your coveted breakfast favorite while doing your joints a favor. First thing’s first: make your flax eggs. In a small dish, add 6 tbsp. cold water to 2 tbsp. ground flax seed and whisk with a fork. Place it in the fridge for 10-15 minutes. Warm up your waffle iron to a high setting and start grating your potatoes. If you’re cool with a little skin, there’s no need to peel them first. I grated mine using the coarse side of a cheese grater, but if you’re down to spend a little more time, you can make do using a fine technique with a peeler. Once the potatoes are grated and the flax eggs have thickened, throw the potatoes, flax, coconut oil, cumin, paprika, salt, cinnamon and pepper all into a large bowl and mix it up until everything is even. Let it sit for a few minutes to thicken up some. Grease up your waffle iron and scoop enough mixture to reach the edges while not spreading it too thin. 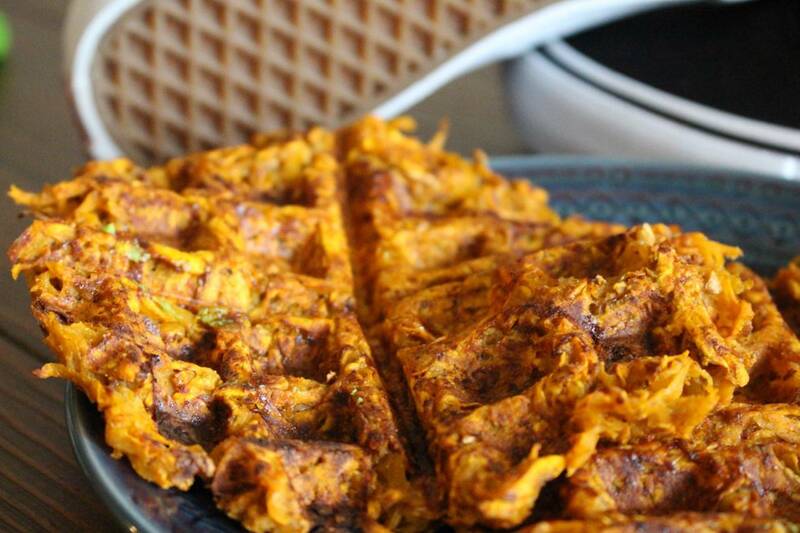 Press it into the waffle maker and cook for 5-6 minutes on high or until the outside is crispy. 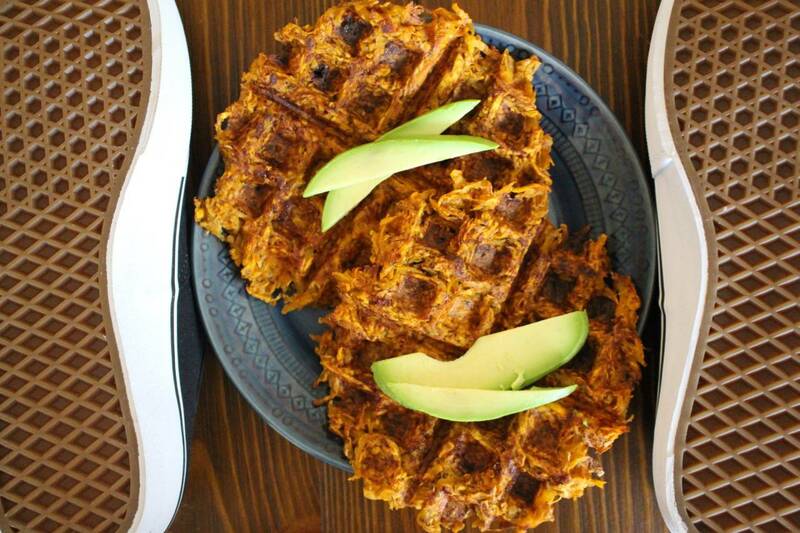 Top with avocado (or a topping of your choice) and enjoy a soleful tribute to the waffle sole! Karsten will be competing on the Norwegian team. World Industries’ original artist provides insider information on the legendary brand. Read the new review for Netflix’s ”The End of the F***king World” series.